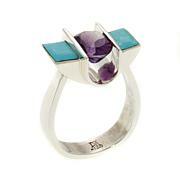 Don't let the sun set on your chance to own this Desert Sunset stone ring from Jay King. Its sizeable, multi-tonal Australian gemstone, set in polished sterling silver, will make a memorable style statement on any finger! 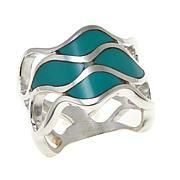 The ring is very comfortable to wear. I like the color of the Desert Sunset Stone. It is a little like Tiger's Eye. Actually, I wear it when I wear my Tiger's Eye pieces. The ring stone I received has 3 rich shades of warm red/brown/golden tan colors, & faceting enhances their glow. The name desert sunset really fits - it reminds me of twilight colors on the horizon as the sun goes down where I used to live in New Mexico. For me the ring runs small, I went up one size for a good fit. I like how the band slightly narrows in the back for comfort. The silver is typical Jay King - substantial & handsome. A steal at this clearance price. 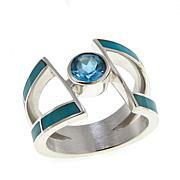 I love the color of this gemstone, mine has both light and dark shades and the faceting enhanced the look. 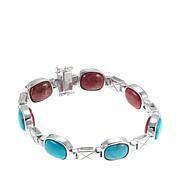 The stone is not too large and great for everyday wear. The ring size is perfect. Great purchase. Mine is 2-tone, just like a sunset would be. 1/3 of my stone is a caramel color, and the rest is the darker, chocolate color. I am happy this one ring will accommodate just about all my ensembles that require a brown ring, light or dark!I WAS NOT crazy about the thin, unsubstantial metal, which kept it from getting 5 stars. Comfortable fit though, TRUE TO SIZE and easy to wear. It will become a go to favorite. 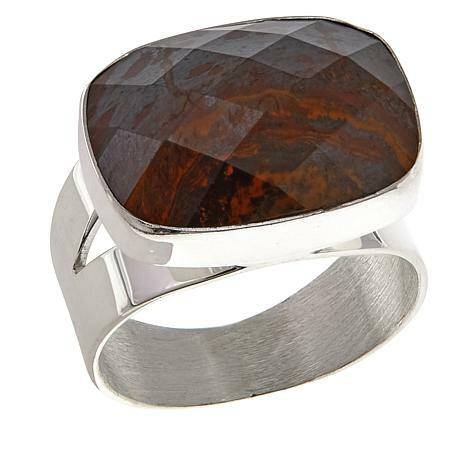 Ordered this ring because of the brownish color. It arrived looking NOTHING like how it was advertised. It has a two tone color, half was Carmel and other a brownish color. Sort of tiger eye look. I got the size 11 and it fit well. It matched many Brown accessories. I am pleased. The silver finish is beautiful. Gave four due to the very two tone color, very matte.